Centre-back Ben Gibson believes that Middlesbrough will benefit from their testing trip to League One side Accrington Stanley on Saturday, despite slipping to a 4-3 defeat. Ross Sykes bagged an 88th-minute winner for Stanley at the Wham Stadium, after Boro rallied from 3-1 down to level matters. 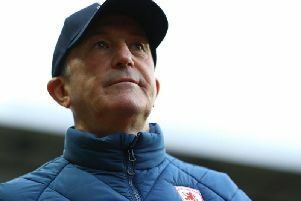 Boro struck first when Stewart Downing found ex-Sunderland midfielder Paddy McNair, who used his strength to keep a defender at bay before finishing clinically. Billy Kee fired wide from the penalty spot after Boro’s Ryan Shotton felled the lively Kayden Jackson, but Accrington levelled with a Mark Hughes header from a corner. Kee converted his second penalty, after George Friend impeded Jordan Clark, to make it 2-1, and the hosts added a third when Jackson hit a fine effort out of the reach of keeper Darren Randolph. Jonny Howson roused Boro with a stunning 30-yarder early in the second period, then Adama Traore squared the game with a pacy run and excellent shot. McNair volleyed over the bar as Boro pressed for a winner, but Accrington bagged the decisive goal when Sykes netted at the back post late on. Gibson, with just one friendly to come, against Sunderland on Friday, told mfc.co.uk: “It’s important to get minutes, get sharpness, and to iron things out – we’ve still got plenty to do to set us up for the season. “It was a very competitive game. Fair play to Accrington Stanley because they were brilliant. It was exactly the kind of test we need. “You want it to be a test, physically, mentally, and you want it to stand it in good stead. Obviously we want to win games, but you’re happy to get 90 minutes in the bank, and, barring Rudy [Gestede] coming off, everyone’s in good shape. “Training has been so tough – Austria, Germany, the gaffer’s had us doing all sorts. Some of us have played two 90 minutes already now which is quite early compared to what I’ve experienced in the past. Boss Tony Pulis added: “It was a very open game as you can see by the scoreline, which is good. We wanted it to be open and we wanted to have people running round. “When the season starts, we’ll be a bit tighter than that, but we want people to get up and down the pitch and really work hard and you’ve got to give them credit – they’ve worked really hard and scored some good goals. Stanley boss John Coleman said: “I like to win games, so I was pleased we got the goal at the end. “I thought we were terrific in the first half, pressing, the passing that we did. Accrington Stanley: Maxted, Johnson, Hughes, Donacien, Richards-Everton, Conneelly, Clark, Brown, Kee, Jackson, McConville. Subs: Savin, Nolan, Sousa, Wood, Mingoia, Finley, Sykes, Williams, Trialist.